When many bands have leftover material, they end up as outtakes or B-sides. When Opeth had an abundance of acoustic material left after bringing “Deliverance” to life, we got a masterwork. To hear Peter Lindgren tell the story (in an interview with the band included on the “Lamentations” DVD set), someone in the band or who is associated with them had the idea to do a really heavy album. The mellow sections that were not used in “Deliverance” became “Damnation,” and the band decided to release them both simultaneously, giving the dynamic of having one heavy album and a mellow one. Effectively it is taking the dynamics of Opeth up to that time and splitting it into its two extremes. “Deliverance” remains one of my favorite records of all time and I do think it is underrated, but I cannot deny the magic of “Damnation.” It is stripped down, even more vulnerable and emotional, and captivating in its soft passages and mournful, ghostly sighs. When I first heard this record I was in disbelief that one of the weirdest bands I knew was able to play so simply (to the point where I could play the drum parts for once), yet so swimmingly well. 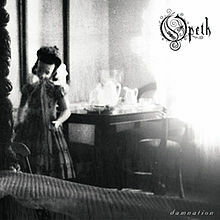 One aspect of “Damnation’s” beauty to me is how it is still so very Opeth, even though there is no denying that this is a progressive rock album. “Windowpane” is mellow but classic Opeth, with some riffs that might sound every bit as good with heavy distortion. “In My Time of Need” is a simple but sweeping rock ballad that tells us where the album is heading next, to a groovy, weird prog rock experience that takes on heavy influences from South American and Middle Eastern styles. After the eerie guitar outro of “Closure,” we are treated to Mikael Akerfeldt bleeding his lyrics into the microphone with the heartfelt “Hope Leaves,” a song that brings tears to my eyes merely thinking about it. “To Rid the Disease” follows this up with painful majesty, then the Camel-inspired “Ending Credits” sends the record off on a hopeful note. The only chink in the armor I am going to give this record is for the final track, “Weakness.” It is soulful and heartfelt, vulnerable as can be. I like the lyric and the mood, but there is so little to it, and it undoes the vibes of “Ending Credits,” taking me out of the ethereal bliss brought on by the rest of the record. “Weakness” strikes me as the last of the last bit of material the band had left after making two records, and maybe it would’ve been better served to be part of a larger piece on the next record. Similarly with “Blackwater Park,” there’s so little I can take away from a review of this album that isn’t exaltation. “Damnation” has the added benefit on its side of listenability, as it has no heavy guitars, no double bass, no death metal growls, so it’s quite easy for a wider variety of listeners to jump into and enjoy this record, especially with Mikael’s soothing, affecting vocals. What I like to point out, though, is that unlike future albums, “Damnation” still sounds unmistakably like Opeth. Every band member’s part stands out and is essential. Keyboards and mellotrons are used more here than on any previous album but are not absolutely necessary for these songs to work. Even when mellow and stripped down, this still sounds like Opeth, which I unfortunately cannot say once we go far enough into the future to hit “Heritage” and further works. That last bit is of course divisive of me to say but I will elaborate more on that in the future.